In the early 1960s, the international community started to get serious about reining in the effects we have on the world’s other species. But political resolutions and guidelines haven’t always cut it when it comes to protecting some of the world’s most endangered wildlife. Just this year, for example, Kenyan president Uhuru Kenyatta took it upon himself to send a message to both poachers and would-be consumers of black-market products by setting fire to over 15 tons of illegal ivory, or about $30 million worth (he plans to get through a full 100 tons of it the same way soon)—something his predecessor had done with 5 tons of ivory in 2011 in much the same spirit. The two presidents haven’t been alone in getting creative with the task of protecting wildlife, either. Here are nine more initiatives that show that, in order to do our best work toward protecting threatened life on this planet, we sometimes need to think outside of “Save the Whales” donation boxes. 1. ROBOTIC DECOY ANIMALS HELP CATCH POACHERS IN NORTH AMERICA. Poachers threaten the survival of countless life forms around the world, including various species of deer that live in our North American forests. To give deer and other creatures more of a fighting chance, game and wildlife departments across the country have employed surveillance-equipped robotic decoy animals for catching any poachers that try to hunt deer in the off season. Wildlife enforcement officers manipulate lifelike deer, bears, and coyotes with a remote control in order to trick poachers into taking a shot. When they do, police who had been hiding in nearby brush reveal themselves and arrest the slightly perplexed poachers. 2. 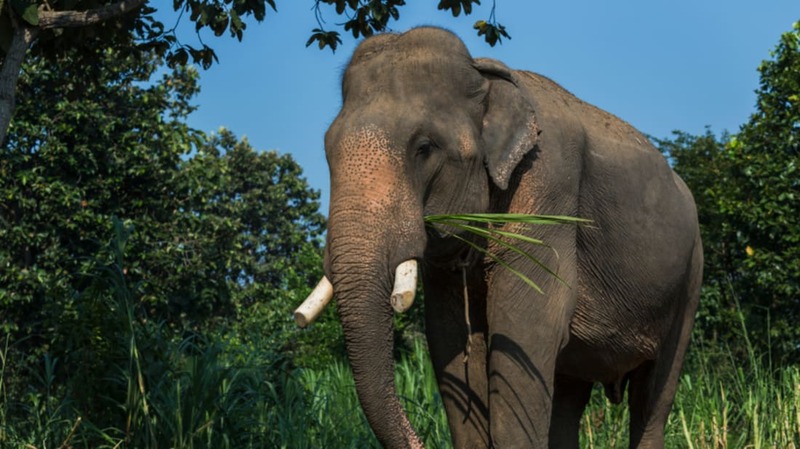 TEXT MESSAGES ALERT RESEARCHERS TO ELEPHANTS’ MOVEMENTS. Researchers have been tracking animals’ movements and behaviors for decades using small tracking devices superficially attached to the animals (tags attached to pigeons’ legs, for example). More recently, the scientific and wildlife protection communities have been teaming up to use tech to help animals and their human neighbors keep in better touch. One project seeks to track endangered wolves’ movements via GPS-tracking collars so nearby humans can stay well out of their way. In Kenya, meanwhile, special GPS collars with chips containing SIM cards are placed on elephants. The chip sends a text message with the elephant’s location to researchers. Conservationists use this information to track the large mammal’s migration patterns. It also sends a message if the elephants cross a “geofence” which tells the researchers that the elephant is on its way to destroy farms, which has dramatically reduced human/elephant conflict. 3. A SPLASH OF COLOGNE ATTRACTS BIG CATS. Zookeepers discovered long ago that a spritz of cologne in an animal’s enclosure piques its curiosity. In 2007, researchers at the Wildlife Conservation Society in Guatemala took this idea to the field in order to determine the size of the jaguar population in the Maya Biosphere Reserve. They sprayed designer cologne on hidden, heat-and-motion-sensitive cameras meant to record the stealthy animals. The scent draws the jaguars to the cameras and keeps them occupied long enough for the researchers to get a good look (researchers analyze spot patterns to count the animals). Thanks to the cologne, hidden cameras have given scientists an unprecedented look at how the cats behave in their natural habitat. 4. ZOOKEEPERS ARE ACTING AS MODERN-DAY NOAHS (MINUS THE ARK). The Association of Zoos and Aquariums (AZA) established its first Species Survival Plan Program in 1981, and since then has developed 450 SSP Programs, which use captive breeding to increase the populations of species (such as the giant panda, California condor, and lowland gorilla) failing to thrive in the wild. In 1985, an SSP Program brought African black rhinos to a Texas ranch for more spacious breeding grounds. In the past several years, scientists have explored the controversial idea of using preserved genetic material from extinct species to clone them back into existence. The process has come a long way, but hasn’t yet enabled a once-gone species to jump back from the grave for more than a few minutes. 6. DNA TRACING MAY ALSO HELP STOP POACHERS IN THEIR TRACKS. Researchers can now use DNA samples to find the source of poached ivory. Earlier this year, zoologists compared the DNA in a shipment of poached tusks with the genetic traits found in elephant dung DNA in order to decipher where the poachers did their dirty work. In the future, customs and environmental protection officials may be able to use this research to test animal products’ DNA and know, definitively, whether a piece of hide or hair has been poached or not. 7. AUSTRALIAN RESEARCHERS TAUGHT QUOLLS TO STOP EATING POISON. Researchers at Sydney University found fairly wild success with their experimental method of teaching northern quolls, petite and endangered marsupials, to stop chowing down on a toxic and invasive toad species. For the past several years, the researchers have been feeding quolls dead cane toads laced with a nausea-inducing drug. The quolls then come to associate the toads with feeling sick, and avoid the cane toads once released back to the wild, hopefully passing on this critical information to their offspring. 8. AIRPLANES SHOW WHOOPING CRANES THE WAY HOME. Hunting and development caused the population of whooping cranes to plummet to only 15 individuals by 1941, all members of a single flock. In order to save the birds, conservationists declared the breeding ground in Canada and the area in Texas they migrated to as protected territories. Meanwhile, to reintroduce whopping cranes to territories they once occupied, biologists decided to sneak whooping crane eggs into sandhill crane nests in Idaho, hoping that the foster parents would teach them how to migrate to new areas. While the fostering and migration were successful, the whooping cranes imprinted on the sandhill cranes and never figured out how to breed with each other. Now, captive-born whooping cranes are being taught migratory patterns thanks to a group of humans in ultra-light aircraft leading them between their new homes—the whooping cranes are even exposed to the sound of the aircraft in the egg so they’re more comfortable around the planes. The result has been that the population now stands at almost 500 in the wild. 9. DEODORANT IS HELPING TO SAVE NEW ZEALAND’S NATIVE BIRDS. New Zealand’s native bird population has dwindled precariously close to extinction as mammals, such as cats and stoats, have picked them off. The reason, some believe, is their smell. Researchers suggest that the birds’ famously pungent odor, which may used to attract mates, has also been sending a signal to nearby cats and other invasive predators, putting them in danger. Birds that evolved in environments alongside land mammals have shed this strong odor, but kiwi birds weren’t so lucky. To help boost the New Zealand birds’ chance of survival, some animal scientists have been working to develop a sort of deodorant for the endangered birds. To learn more about the steps being taken to protect endangered species, tune in to Racing Extinction on December 2 at 9PM ET/PT on Discovery. The problems our planet faces are overwhelming, but the solutions can start with you. Inspired by the message in the film, #StartWith1Thing is a call-to-action to each and every one of us across the globe to make small changes in our lives that will have a huge impact on the world. Join the Movement. #StartWith1Thing.